Catholic Relief Services was created by a disaster—a manmade one called World War II. Our first decade focused on supporting victims of that war with food, clothing, housing and, in some cases, moving them to new countries for a fresh start. Crosses fill a genocide memorial on former church grounds preserved to honor the victims. The Rwandan genocide took the lives of some 800,000 people in the spring of 1994 and led to deep soul-searching at CRS. We’d been working in Rwanda since 1960 on a variety of aid projects that all seemed successful. But something was clearly missing if we had not mitigated this hatred. That soul-searching led us to what we call the “justice lens”—a way of looking at our work based on the Catholic social teaching and the rights of all people to live in just and peaceful societies. It brought into focus the need to give not just material aid, but also to redress grievances and imbalances to foster healthy relationships. We used this lens as we designed post-genocide programs in Rwanda that brought together perpetrators and survivors to help them build a more just and prosperous future. 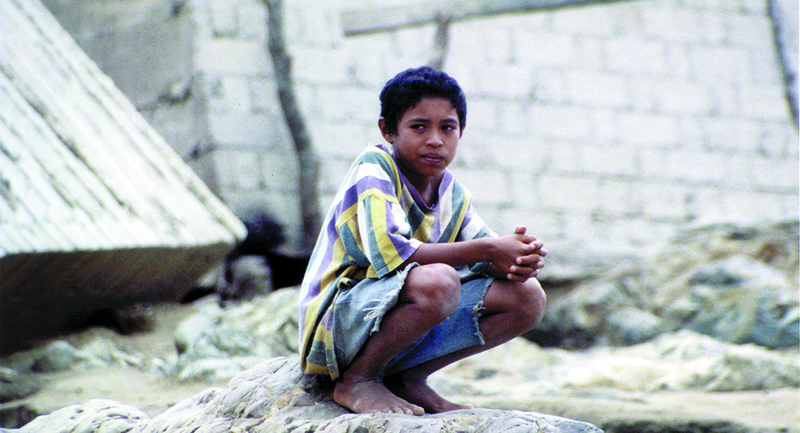 A Honduran boy crouches amid ruins left by flooding and mud slides from Hurricane Mitch. Photo taken approximately 43 days after Mitch hit. When Hurricane Mitch’s 180 mile per hour winds hit Central America in October 1998, dumping a year’s worth of rain in 3 days, more than 10,000 people died. Taking lifesaving measures and addressing people’s immediate needs was necessary but not sufficient. We wanted to ensure that we would address the iniquities that were the foundation of poverty in the area. Working with Church and local partners, we helped communities organize so they could advocate for their own needs. 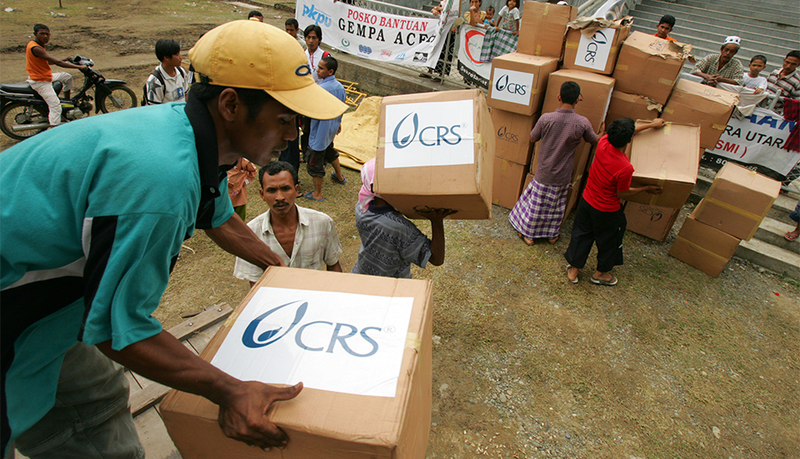 CRS distributions reached families who sheltered in camps following a deadly tsunami. Along with food, CRS delivered household items that helped survivors maintain a semblance of normal life as the long process of recovery began,. An earthquake triggered the massive Indian Ocean tsunami the day after Christmas in 2004. The death toll topped 200,000. Indonesia, Sri Lanka and India were especially hard-hit. We launched immediate help and a 5-year response plan, engaging survivors and partners as we set about rebuilding markets, homes, water systems, transportation infrastructure, schools and hospitals. Innovations in shelter, water systems and sanitation methods led to international recognition by peer organizations and governments. A CRS hygiene kit awaits distribution in a CRS warehouse in Port au Prince, Haiti.shortly after the city was rocked by a 7.0 magnitude earthquake. The 7.0-magnitude Haiti earthquake hit in January 2010, destroying large sections of Port-au-Prince, killing an estimated 230,000 and leaving some 1.5 million without homes. CRS was there immediately with food, shelter, water and other help. Even amid the unprecedented emergency response, planning began for “building back better.” CRS has helped thousands of Haitians in the years since the earthquake and continues to work to overcome obstacles in the way of better permanent housing. We have been in Haiti since 1954 and will stay with its people, dedicated to their progress. CRS has helped families and communities in Central Philippines recover with water and sanitation, shelters, livelihood and other projects. In November 2013, Super-typhoon Haiyan, one of the largest storms ever recorded in the Philippines, made landfall and quickly traversed this nation of islands, killing more than 6,200 and leaving some 4 million homeless. 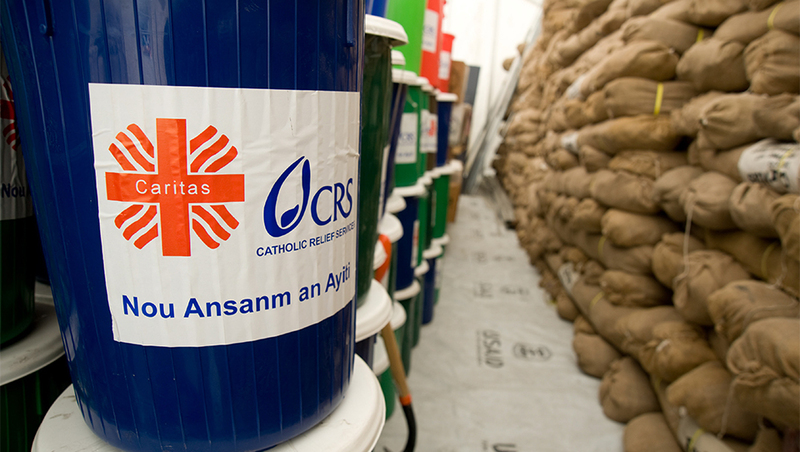 Working with the local Church and Philippines Caritas, we quickly began distributing tarpaulins as well as food, water and sanitation supplies, the first step in a 5-year program to “build back safer.” CRS programming included job training, improved sanitation and storm preparedness.